I’m flying via San Francisco to Auckland. There is no direct flight from Vancouver to Auckland today. I’m on United Airlines for the North American leg. I pay $24 to upgrade to Economy Plus and once again the front row window seat says, ‘pick me’. I say, ‘Ok’. I enter USA in Vancouver airport. Saves a lot of hassle at the other end. I buy a dream catcher as a souvenir and a banana for a snack. 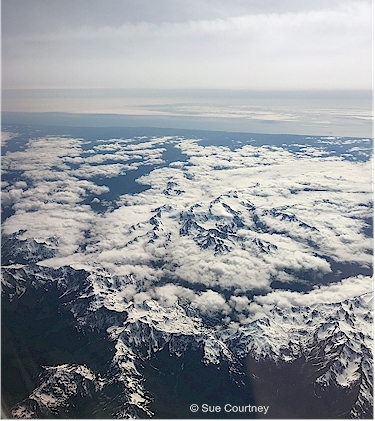 The Cascade Volcanoes are hugged by clouds today. 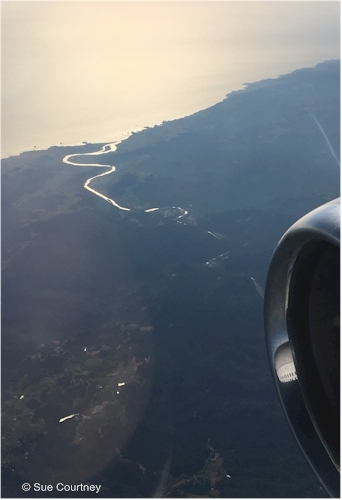 … but further down San Francisco Bay as the plane prepares for its landing from the south, making its turn over the colourful ponds of the waste water plant, my eyes pop at the length of a causeway. 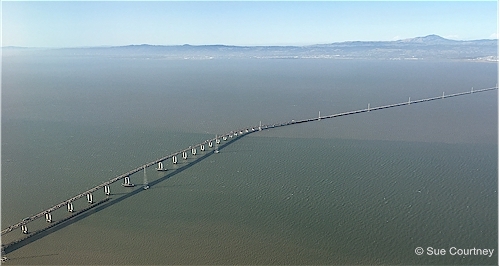 I google to find it is the 11.3 km / 7-mile San Mateo – Hayward Bridge. It is a nice little tiki tour of SFO from the air. I’ll have to come back and do it on land sometime. My land experience this time is walking from the Terminal 3 to the adjacent International Departure Hall. I change my clothes for the journey ahead, tidy up, jam as much as I can into my trolley bag and check it in. Jenise’s brother Chris is there. He works for AirNZ. He asks if I’d like to go to the Business Lounge. Yes please. Air New Zealand hires another airline’s lounge and the wine is from California. I pour a smidgen of the Brass Tacks Monterey Riesling 2013 and take a sip – not what I’m looking for in riesling at all. 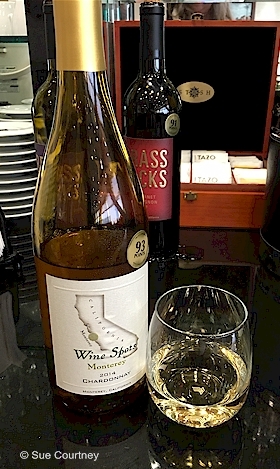 However White Spots Monterey Chardonnay 2014 delivers bold, buttery California chardonnay expectations. I’m not sure really where I am in time. I’ll be a time traveller soon – travelling forward to New Zealand Standard Time. My flight departs on the 16th but when I land in Auckland tomorrow it will be the 18th. The 17th May 2016, if it existed at all, is the shortest day of my life !!! This entry was posted in Travel, USA by Sue Courtney. Bookmark the permalink.